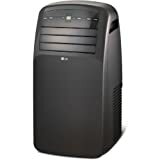 LG Electronics - LP1214GXR : Portable Air Conditioner Review • The Air Geeks, reviews of air conditioners, dehumidifiers and air purifiers. 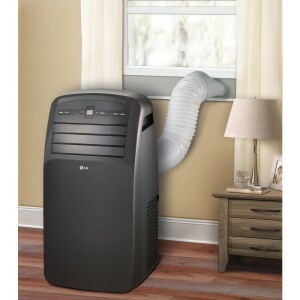 The LG LP1214GXR is a portable air conditioner that is designed to provide your room with cool, clean, and fresh air. This system does not need any permanent installation and users can easily move it from one part of the house to another. For people who live in humid places, this system features a dehumidifier to ensure that your cool room is free from excessive moisture. With this system in your house, you will certainly feel comfortable as you relax in a cool environment. In addition, it comes with features that enhance comfort and ease of use. The system is also specially designed to cool your room quickly. However, as we shall see, this unit is not without its drawbacks : noisy and not hands-off, which prevents us from falling in love! Our review at The Air Geeks. The cooling capacity of an air conditioner is one of the most important things that you should consider when choosing a unit for your house. If your house is relatively large, then you need a high capacity air conditioner and vice versa. This unit is designed to deliver a cooling capacity of 12,000 BTU. At this capacity, the unit can effectively cool a large space. According to the manufacturer, this unit is suitable for a 450 sq. ft. space. In addition, this system is designed to bring the temperature down within a short time. Moving a heavy unit from one position to another can be stressful. This portable air conditioner features castor wheels and it is therefore easy to push it from one room to another. In case you don’t want to permanently install your air conditioning system, then you need a unit that you can easily move. This unit scores highly as far as mobility is concerned. Furthermore, this portable unit weighs 61.7 pounds. Installing an air conditioner can be a stressful exercise if there are no materials to guide you. To spare you such stresses, this unit is specially designed for easy installation. By following the instructions that come with the system, anyone can install the unit within a short time : we liked that ease of use. Like most portable air conditioners, this unit comes with an easy-to-install window venting kit. This kit is designed to fit in most standard windows. For some windows, minor modifications may be required for the window vent to fit perfectly. It is important to use the manual during installation in order to get good results. Depending on the conditions of your room and how you want to transform the environment to suit your needs, you may want to adjust the settings of your portable unit. This system offers you a variety of options. 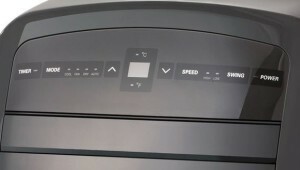 Depending on how fast you want to cool your room, you can select one of the three cooling speed options that it offers. In addition, this portable system offers three fan speeds. The rate at which an air conditioner cools a room is dependent on how it is designed to blow air. This system is designed to distribute cool air evenly in order to bring the temperature down within a short time. In addition, this unit has auto swing louvers that enhance the effectiveness of its air discharge mechanism. • The unit comes with an LCD remote control. • Unit offers an energy saver feature. Recommended Room Size 450 sq. ft.
Easy set up. It is easy to set up the LP1214GXR portable unit. By following the manual, you can install the system and its window vent in less than thirty minutes. Effective cooling. When properly installed, this unit cools the room quickly and effectively. We are somewhat impressed by its performance. The LG needs maintenance to prevent water leakage. The system requires manual emptying of the tank. Failure to check the tank on regular basis can result in to water leakage. This is a big dealbreaker for us, as we know most of you expect a hands-off experience with these beasts. This unit is slightly loud. Just like most air conditioners, this unit produces loud sound that can be disturbing to some people. This is not terrible or even annoying, but this is worth noting. EXCELLENT AC UNIT! Here in the Seattle area, not a lot of people have AC units, so its hard to know what is good or not. This summer was unusually hot, so I decided to buy this unit and cannot be more pleased! It cools very quickly and has a good variety of settings. The Energy Saver feature is especially nice. I've seen other users say that these are "loud". They are no louder than any other AC unit on the market, and not really all that loud or annoying at all. Frankly, if you don't like the sound of the compressor cycling on-and-off, sit there in the uncomfortable heat." This unit is very polished with nice chiming noises for button pushes, motorized swing feature vent, LCD remote and great construction. The hardware included for the exhaust tubing was better than expected. It fits larger windows than stated in the specifications. The LG website even has a video to show you how to install into different types of windows properly. The noise is a bit louder than I expected but it isn't terrible, a consistent white noise. The packaging is easy to unpack as well, so you don't have to lift the entire unit more than a couple inches. Cooling starts very quickly and different modes allow you to adjust to save energy. Overall I am very happy with this unit for the couple weeks I have had it, no problems so far." The South Korean brand delivers on the essentials : effective cooling after an easy install. We are satisfied with this unit, designed to provide your room with cool and clean air : to be fair, it does so effectively. However; its water drainage section does not work effectively, and requires the user to pay attention. For The Air Geeks, this is a big no-no, as we always advise peace of mind over cheap one-time price.